Lighting at a ceremony, reception or special event can make a huge difference in the mood of the party. The following images show centerpieces with and without pin-spotting. 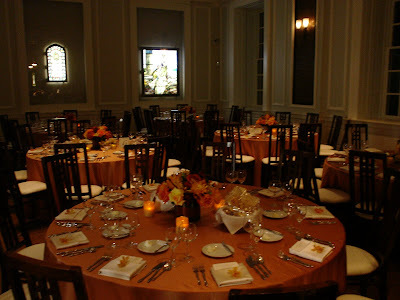 The first photo shows short, full arrangements on the tables without any special lighting or effects. 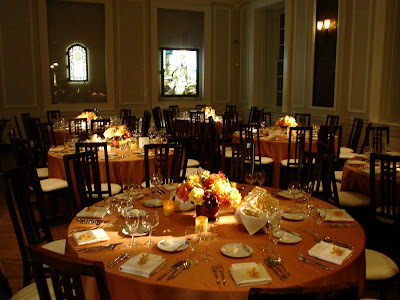 This image shows the same tables and centerpieces highlighted with pin-spotting. The centerpieces are illuminated at each table and the lighting really showcases each piece. Pin-spotting can be fairly inexpensive and really makes an impact in your room. Consider using special lighting to highlight the special touches you have added to your event.